This fudge is actually a second try. The first one was a regrettable failure: so chocolatey that any trace of banana was obliterated, and with sugar crystals big enough to actually see. I really wanted to make this work, though, so I found a different (and much better) recipe and started all over again. This recipe is adapted from one by Elizabeth LaBau on About.com. 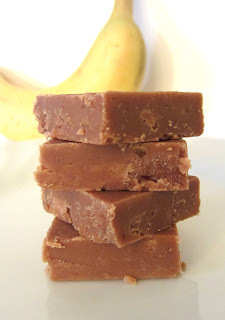 I found that this fudge takes longer to cook than a standard version. It isn't difficult, though, and the results are great! This candy is smooth and creamy. You get a nice chocolately flavor and the banana really shines through. Walnuts would be a great addition, too! 1. Line a 9" X 9" square pan with parchment paper. Set aside. 2. Combine the sugar, banana, milk, corn syrup, chocolate, and salt in a large saucepan set over medium-high heat. Stir until the mixture begins to boil. 3. Reduce the heat the medium (if the mixture is in danger of bubbling over, you can reduce the heat to medium-low). Attach a candy thermometer. Cook, stirring often, until the mixture reaches 240°. 4. Remove the pan from the heat. Remove your spoon/spatula, but do not remove the thermometer. Scatter the butter pieces over the top and add the vanilla extract. Do not stir! Let the mixture sit undisturbed until it drops to 110°. 5. Using a wooden spoon, stir the mixture until it begins to thicken and lose its gloss. Quickly pour the mixture into the prepared pan and spread into an even layer. Let the mixture cool completely before cutting.